When I was a kid a long time ago (in the early 90's) the death metal scene was growing, and demos were a big part of the scene. Somewhere along the road, when the scene exploded, it was almost impossible to keep track of all the unsigned bands. There wasn't enough time or money to focus on anything but bands that were signed. This EP from the unsigned UK-based blackened death metal band Aetherium Mors makes me wonder how much I've missed out on. 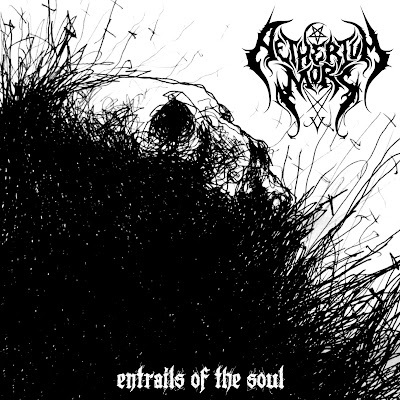 Influenced by bands such as Death, Carcass, At The Gates and Dissection, Aetherium Mors manages to make their own blend of blackened death metal. And it's a damn fine blend. The music is intense and complex, but it never gets too much. The band balances the extreme with the beautiful very well. Entrails of the Soul is the second release from the band, and it's completely self-produced. They've done an excellent job. The sound fits the music perfectly. The heaviness of death metal mixed with the coldness of modern black metal makes this a very enjoyable album to listen to. Lyric wise it's the kind of lyrics one would expect in this kind of music. Anti-christian. But they've managed to make the lyrics more poetical than many other bands in the genre. These guys needs to be signed A.S.A.P., they need to be given the possibility to release a full-length album. Because, I for one, want to hear more. If this is just a taste of what's to come, I can't wait. This is an eargasm.